In the wake of a Go Public report earlier this week about TD employees pressured to meet high sales revenue goals, some TD workers reveal they have broken the law at their customers' expense to hit their targets. TD insists all its employees are to follow the company's code of ethics, but many employees who contacted Go Public said that's impossible to do given the sales expectations. "I've increased people's lines of credit by a couple thousand dollars, just to get SR [sales revenue] points," said a teller who worked for several years at a TD branch in Windsor, Ont. He admits he didn't tell the customers, which is a violation of the federal Bank Act. 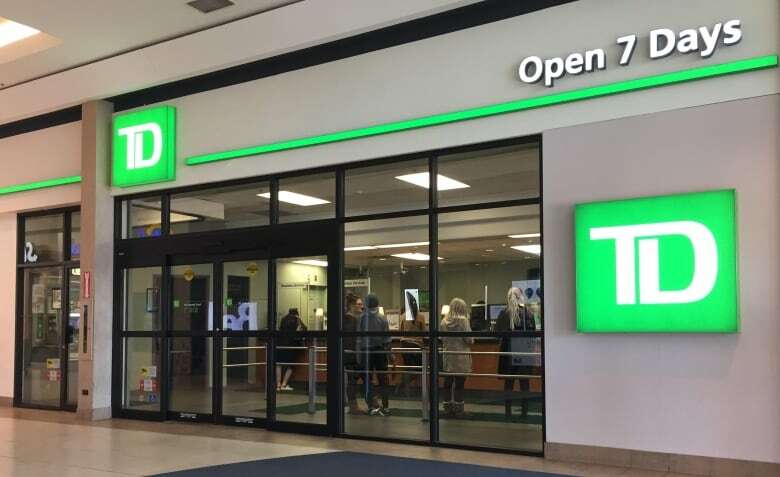 Another teller with over 20 years' experience at an Ontario TD branch said she has increased customers' overdraft protection amounts without their knowledge, and increased their TD Visa card limits on the sly — all to earn units towards her sales revenue target. Many TD workers wrote to say they are on medical leave, suffering from anxiety and/or depression because of the constant pressure to upsell customers. One teller on sick leave described how a manager stood behind her three times a day, pushing her to sell more. "They just really stress you out and say, 'You're not doing good. I need you to do double the amount you've been doing.' I couldn't sleep. I'd be thinking … 'What can I do tomorrow to try and get sales?'" She admits to upgrading customers to a higher-fee account without telling them. "Because that gives us sales revenue. And the customers don't have to sign for it." 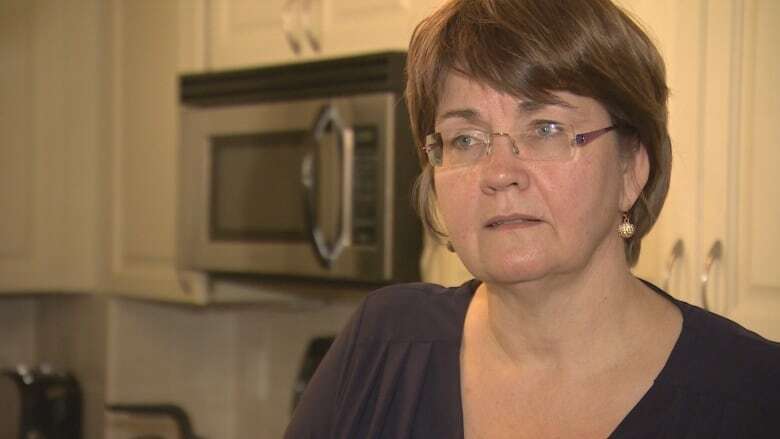 Bev Beaton believes she's been a victim of a TD teller desperate to generate sales revenue. In January, she noticed a service charge on her account for $29.95. 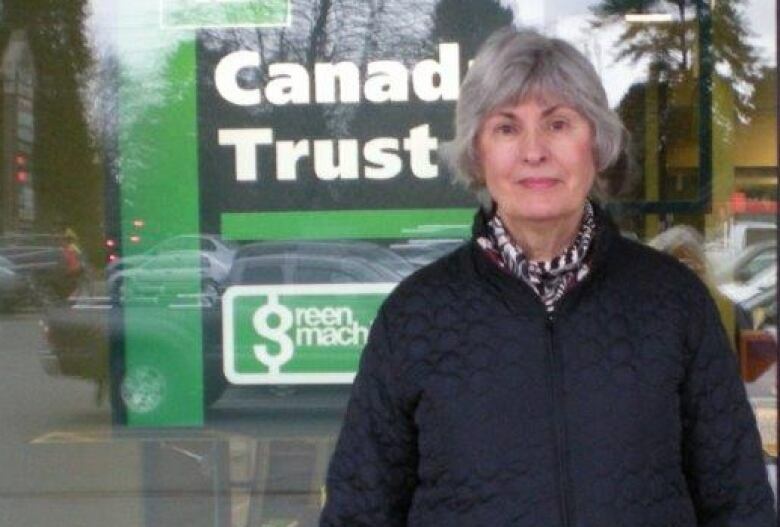 When she called TD to ask about it, she was told it was because she was in an account that required her to keep a minimum monthly balance of $5,000 or she would be charged that monthly fee. "I said, 'I did not ask for this account. There's no way I would have asked for this account.' And [the bank employee] said, 'You must have.'" When Beaton checked her statements, she saw that she'd been moved to the higher-fee account last May, but only noticed when her balance dropped below $5,000 for the first time in December and she was hit with the service charge. "I was very annoyed," Beaton said. "And I think it's dishonest. Because if I wasn't looking at my statement closely, I wouldn't have noticed the $29.95." In a written statement to CBC News, the CEO of TD Bank Group, Bharat Masrani, said TD has "a long history of providing great customer service." TD employees tell Go Public the pressure to deceive customers extends beyond front-line staff to workers handling wealth management. "We do it because our jobs are at stake," said one financial adviser in Ontario. She admits she acted in her own interest rather than that of her clients after being put on a Performance Improvement Plan — a program that involves coaching and could result in termination of employment — because she wasn't meeting her sales targets. "I have invested clients' savings into funds which were not suitable, because of the SR [sales revenue] pressure," she said. "That's very difficult to admit. I didn't do this lightly." A former TD financial adviser in Calgary says he would downplay the risk of products that gave him a big boost towards his quarterly goal. "I was forced to lie to customers, just to meet the sales revenue targets," he said. "I was always asked by my managers to attach unnecessary products or services to the original sale just to increase the sales points — and not care if the customer can afford it or not." A financial adviser who worked for six years in Nanaimo, B.C., before quitting says "people eventually snap, or lose all sense of themselves and do anything to close sales." "I have had multiple conversations with branch and district managers. These conversations led to my being asked if I was still the right fit for the job." In statement provided to Go Public, TD spokesperson Daria Hill wrote every employee must "act ethically and ... not allow a focus on business results to come before our focus on customers." 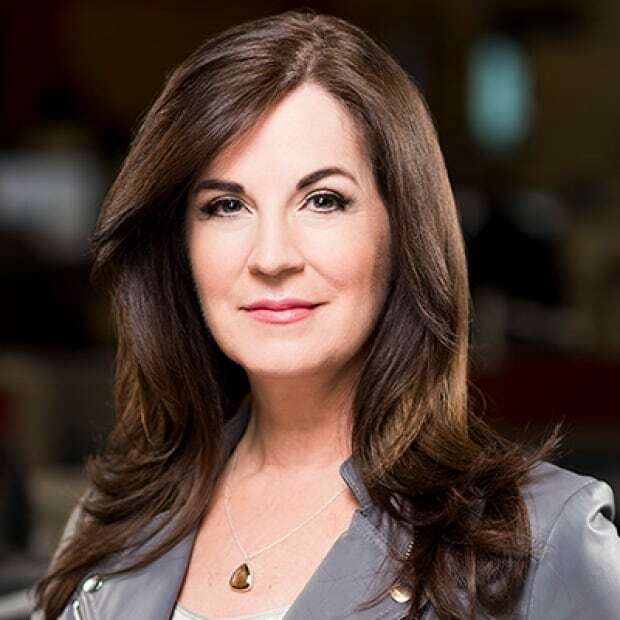 In an internal letter written to TD employees and obtained by Go Public, Andy Pilkington, executive vice-president of branch banking, wrote, "We don't believe the [CBC] story is an accurate portrayal of our culture," but said the report was an opportunity "to pause, reflect and ask ourselves ... how we can do better for our people and our customers." One TD teller balked at Pilkington's letter, sending an email to Go Public that says, "Maybe if they stood back for a moment and thought about how they have put so much pressure on employees (with ridiculous sales goals) they wouldn't be in this situation right now!" News that bank employees are required to meet what they consider to be extreme sales goals — with some even acting underhandedly — is a concern to Wanda Morris, vice-president of advocacy for CARP, a national advocacy association for people over age 50. "As people age, there's a little bit of decline in their cognitive functioning so they trust others and are potentially at risk from somebody who doesn't have their best interests at heart," she said. "Canadian banks are some of the most profitable companies in this country. I hope we'll see … some more empathy towards both employees and customers." 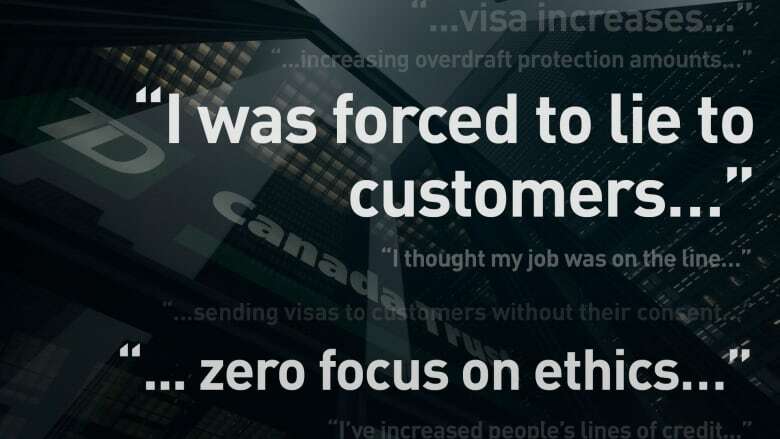 Democracy Watch founder Duff Conacher says the fact that hundreds of bank employees have written to express concern over their high-pressure sales environment is an indication that Ottawa needs to act. "We need the federal government to put rules in place and stop being so negligent — allowing the banks to get away with this unethical gouging and unethical sales practices," he said. 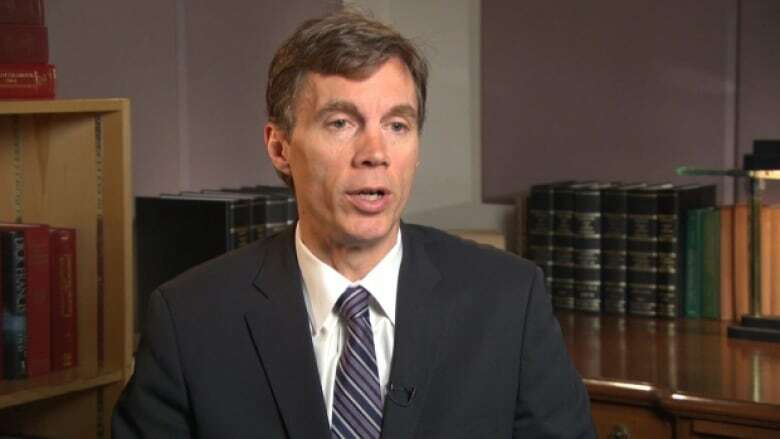 Democracy Watch co-founder Duff Conacher says now is the time for people to push the federal government to improve bank regulations because the Bank Act is currently under review. "The fact that the CBC is revealing this as opposed to [the Financial Consumer Agency of Canada] or the ombudsman for banking services shows just how much the government has failed to ensure that those protection watchdog agencies have the powers, have the mandate and the resources to do their job." Conacher says now is the time for people to pressure Ottawa to tighten bank regulations because the federal Bank Act is currently under review. "I just find it amazing that we haven't seen any political party or politician stand up and say, 'We're going to make these key changes to ensure that banks are required to serve everyone fairly ... and look out for their customers' best interests and not just try and gouge them.'"